The APC variant of BOXER is a true mother ship for soldiers with multiple functions for the infantry and interfaces for network enabled warfare. 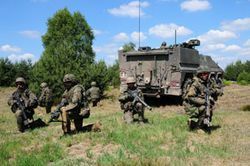 The integral growth potential allows adaptation to future emerging military roles, or changing requirements without degrading the mobility performances. In a first batch the German Army ordered 125 BOXER vehicles in the APC variant. The current APC variant supports leading edge communication systems e.g. IdZ (infantry soldier of the future) of the German Army. 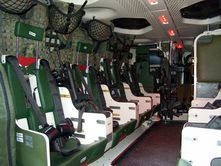 In which the APC provides interfaces to each soldier for updating navigational and tactical information as well as power outlets for charging the personnel electronic equipment. The Mission Module contains state-of-the art C3I architecture to integrate the BOXER APC variant in modern battlefield scenarios. The APC can transport up to 8 dismounts, besides driver, commander and gunner. 3 hatches for "show of force"
5 hatches for "show of force"